Manufacturer & Exporter of Fine Boring Machine for Automobile Industry. 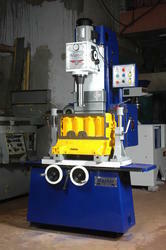 Our product range also comprises of Fine Boring Machine, Vertical Fine Boring Machine and Valve Refacer Machine. Our company is engaged in the business of manufacturing and supplying highly demanded Fine Boring Machine for Automobile Industry. Made available in user-defined specifications, our offered machines are stringently tested on various parameters. These machines are praised by our customers for their easy installation, sturdy construction, and long functional life. Spindle feeds per Revolution .004", .006"
Rapid Motor up & down 0.5Hp, 2800 RPM, Three Phases 440Votls, 50 Hz. AC Drive (Input) Single Phase 220 Volts, 50 hz (Output) Three Phase, 220 Volts, 50 Hz. Approx. weight 1000 Kgs. Approx. Note: We reserve the right to modify the design & specifications because of continuous improvement. Looking for Fine Boring Machine for Automobile Industry ?